Based in cognitive behavioral therapy (CBT), this book provides real, proven-effective solutions. Written by two renowned anxiety experts, the book offers practical exercises and strategies to help soothe your worst worries, fears, and panic. The book focuses on what most often leads you to worry-the fear of uncertainty. In a nutshell, people with GAD worry as a way of mentally planning and preparing for any outcome that life throws their way. With this book, you'll learn to stop seeing uncertainty as threatening-which will in turn, reduce your anxiety and instill a sense of calm. 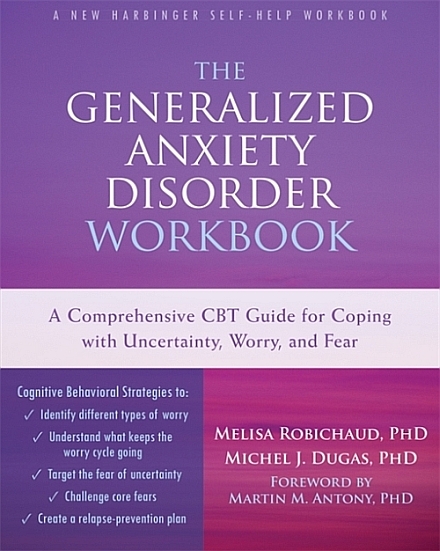 Melisa Robichaud, PhD, is a clinical psychologist and cofounder of the Vancouver CBT Centre. She holds adjunct clinical faculty and clinical associate positions in psychology and psychiatry at the University of British Columbia and Simon Fraser University. Robichaud specializes in the treatment of anxiety with an emphasis on generalized anxiety disorder (GAD), and is on the scientific advisory board of AnxietyBC. For over a decade, she has provided workshops and training to both mental health professionalsand the public on the treatment of GAD, and has published numerous book chapters and scientific articles on the subject. Michel J. Dugas, PhD, is professor of psychology at the Universite du Quebec en Outaouais, and affiliate professor of psychology at Concordia University. Over the past two decades, he has conducted research on the etiology and treatment of generalized anxiety disorder (GAD) with a specific focus on intolerance of uncertainty. He has published over ninety scientific articles and made more than 250 conference presentations on the topic of GAD. Dugas is a Fellow of the Canadian Psychological Association and the Canadian Association of Cognitive and Behavioural Therapies. Martin M. Antony, PhD, is professor and chair in the department of psychology at Ryerson University in Toronto, Ontario. He is director of research at the Anxiety Treatment and Research Clinic at St. Joseph's Healthcare in Hamilton, Ontario, and past president of the Canadian Psychological Association. An award-winning researcher, Antony is coauthor of The Shyness and Social Anxiety Workbook , When Perfect Isn't Good Enough, and more than twenty-five other books. His research, writing, and clinical practice focus on cognitive behavioral therapy (CBT) and the treatment of anxiety disorders. He has been widely quoted in the American and Canadian media.